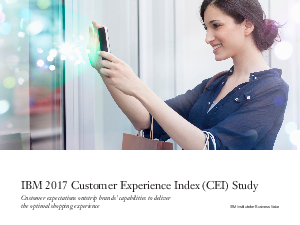 Our fifth annual IBM Customer Experience Index (CEI) Study identifies which brands are providing leading shopping experiences and how they’re doing it. To achieve this, we undertook a global assessment of retail and consumer products brands' customer experience (CX) capabilities from a consumer’s perspective at key touchpoints along the in-store, online and mobile shopping journey using a common set of criteria and a universal scoring system. The 2017 CEI results indicate that brands have significant room for improvement in terms of satisfying customer expectations: On a scale from 0 to 100, the average CEI score is 33.